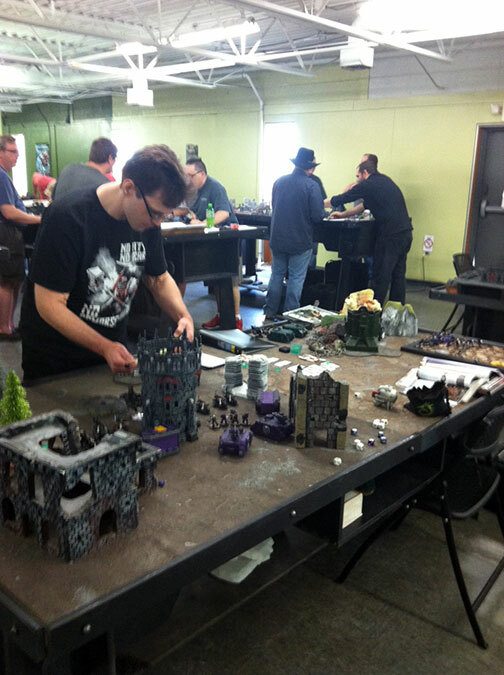 BATTLE REPORT: Warhammer 40,000 – I'm not sure how I feel about random team events. On one hand they're fun and it's a great way to meet new players. On the other hand it can be grueling trying to play a team game with someone you don't know with lists that may or may not work well together. To offset this most events of this type that I've played in are raffle events that don't give a real prize to the overall winner but rather tickets for participation and other random events over the course of the day. Some do it better than others but overall the goal is to keep it casual and focus more on having fun than being the top dog. Round one I faced the ringer for the event in an 800 point match up. He was playing Dark Angels Raven Wing with the big skimmer that gives everything a 2+ re-rollable jink save. I spent the whole game inflicting a tons of wounds that were ignored because of the re-rolls. It was a little frustrating having never faced the force I realized after the fact that I should have just charged and hoped for the best rather than wasting the waste the game hoping he'd roll two ones in a row. My opponent was pretty nice guy which helped make the trouncing tolerable. Round Two I got paired up with Dark Eldar and would be facing odd against a mostly Killa Kan Ork list. Unfortunately the other partner was nowhere to be found so I got to face the Ringer again. The Dark Eldar player was better equipped to deal with the bike nonsense but it was still an uphill battle. The mission allowed you to steal your opponents capture objective 1-6 cards and score on your turn. We go lucky with the way the cards came up and out-scored our opponents pretty badly. Round Three I was paired with a Necron player against a Khorne Daemonkin and Dark Angels force. This was a weird mix of The Relic with generic Maelstrom Objectives. The table was set up rather odd with a raised city potion on one side of the table. (I really liked the idea behind it and might build my own terrain piece with a fortress to defend set up similarly) We didn't size the initiative so the Khorne player ran to the middle of the table to seize the relic with his Bloodthirster. Since it was on the ground I poured lascannon a melta fire into it until is vanished back into the warp. From that point on the game was more of an exercise in playing smart and killing off threats as they presented themselves. This is a game where the benefits of the Stormlance Squadron really paid off. Besides staying safe in my transports most of the game I was able to gun down a unit of cultists charging me while I was on an objective. 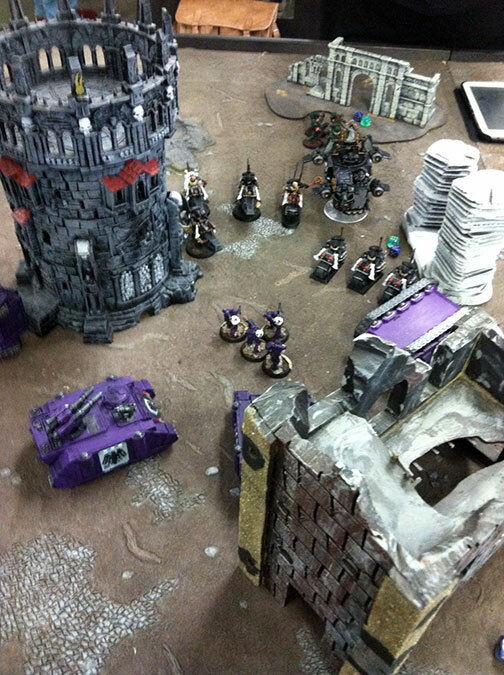 Since the cultists had objective secured they "controlled" the objective when I fired overwatch which allowed me to re-roll my overwatch shots. (pretty strong, ability). Overall I had a good time at the event, 32 players in total made for a busy event. This was my first time at this game store and the overall impression I got was pretty good. They have a good amount of space to play, decent terrain and really nice tables. I'll defiantly be back and might even swing out to meet up with some of the guys I met at the event. The event itself was a little losey goosy for my tastes, even when you're not playing "to win" it's nice to see standings and to keep the rounds tight so the event doesn't go to long. I'm sure for future events they'll pay a bit more attention to that so they can keep this momentum going.